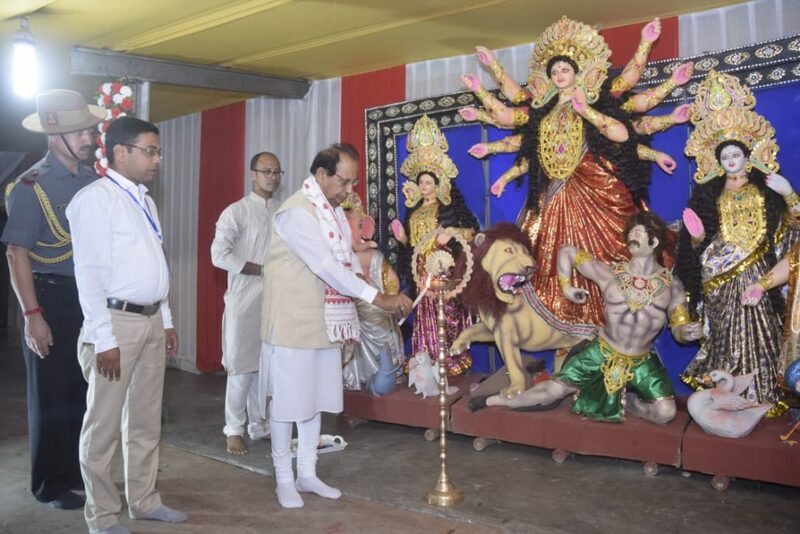 Assam Governor Prof Jagdish Mukhi inaugurated the Bishnupur Durga Puja at Bisnupur in Guwahati on Sunday. Inaugurating the puja the Governor said, “Celebrations of Mother Durga’s sojourn to her parental place is one of the most important festivals of our society. Apart from being a religious festival, it is also an occasion of reunion and rejuvenation and celebrations of our all time bond of universal brotherhood eulogizing our traditions, culture and customs. The Governor also asked the office bearers of the puja committee to be vigilant and put in place measures for smooth celebrations of the puja. He at the same time asked the Puja committee to maintain swachhata. He also took a bow before the deity and prayed for welfare of all sections of the people. Prof Mukhi hailed the Bishnupur Sarbajanin Durga Puja Committee for organizing Durga puja for the 68th year and appreciated the theme of this year which is ‘My India’. He also thanked the organizers for inviting him to the programme which gave him an opportunity to have a darshan of the Goddess. Secretary of the puja committee, Pijush Kanti Dey, president Chandan Paul, artist of the pandal, Manjit Kalita along with a host of other dignitaries and visitors were present at the inaugural function.